I wanted to follow up on using Fedora 19 Xfce at work, and talk about the overall experience of running Linux as my work desktop. Consider this a "macro level" view into usability. Rather than focus on the particulars of a specific program, I'll address the suitability of Fedora 19 Xfce as a desktop replacement. Does Fedora 19 Xfce perform adequately as a work desktop? Does it contain the essentials for the day-to-day tasks in an office environment? Note that I'm not discussing a home desktop in this post. At home, users might choose to run all kinds of software: games, educational or "edu-tainment" software, photo management, music, … as well as programs that folks in a office need to use: web browsers, file manager, and "Office" suite programs. The home desktop may require a deeper "dive" into software use. I'll leave that for another blog article, or maybe for a different blogger to respond to. Before starting, I created a list of the programs I use on my Linux laptop. I conveniently divided the list into three sections: Regular use (daily, or more than weekly), Occasional use (less than weekly), and Rare (less than monthly). After moving to Xfce, I found that I didn't use some of these programs at all, where previously I thought I used at least occasionally. * marked items were installed separately; except for Google Chrome, these were part of Fedora 19, but not included by default in Fedora 19 Xfce. It's not surprising that I haven't yet installed (×) several programs that I use only occasionally or rarely; after all, I've only been using Fedora 19 Xfce for about two weeks. In reflecting on the programs that I actually need, I probably will only bother installing a program (SimpleScan) that lets me use my scanner. I sometimes need to scan things, but I prefer not to manage personal photos (Shotwell) on my work laptop, and I don't do vector drawing (Inkscape) anymore. I also am taking a "time out" from some of my other open source software work, so I don't currently need a programmer's editor (GNU Emacs) or DOS emulator (DOSemu). When I eventually need them, those programs are easy to install. I also don't use Dropbox anymore. I haven't even bothered to install Dropbox on Fedora 19. I originally installed Dropbox to try it out for work, so I could experiment with "cloud storage." But I have only used Dropbox to make backup copies of a few personal files. We have a "private" cloud storage system at work, and I use that for all my important files. While I use Google Docs for almost everything, sometimes I need to print out a Word file or Excel spreadsheet that someone sends to me. If the file is very big, I may prefer to use LibreOffice to view and print the document, rather than opening it in Google Docs and printing from there. In that respect, LibreOffice is only an office viewer in my day-to-day work. The only GNOME program I continue to use under Xfce is GNOME Evince (technically, Galculator and a few others are compiled using GNOME libraries, but aren't GNOME projects per se, and work fine under Xfce). Evince has a nice user interface for viewing and printing PDF files, much nicer than other PDF viewers I've tried. Does Fedora 19 Xfce perform adequately as a work desktop? Does it contain the essentials for the day-to-day tasks in an office environment? I think the answer to both is yes. 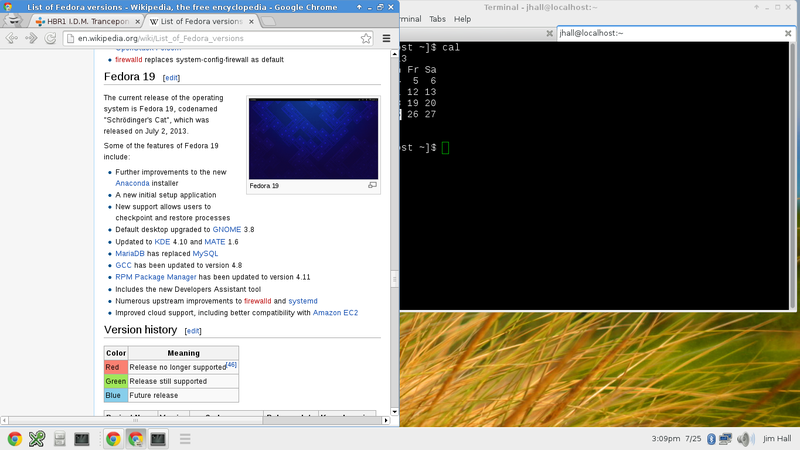 I can do everything I need to do under Fedora 19 Xfce. Less technical folks would have an easier time, I think; most users do not need a terminal or password manager, for example. The Xfce desktop is easy to navigate, and programs are easy to use. Everything listed above has good Familiarity, Consistency, Menus, and Obviousness. My only complaint is that installing printers is confusing. This was an interesting diversion into a specific desktop use case, exploring Xfce at a "high level" view to see how well it performs as a desktop replacement. However, I prefer to use this space for exploring OPEN SOURCE SOFTWARE & USABILITY, so I don't expect to return to this topic again on this blog. Allow me to expand on my previous post about Fedora 19 Xfce and usability. Going beyond merely the usability of the Xfce desktop, how does it perform at work? Since I've been using Fedora 19 Xfce for about two weeks, I thought I'd share some thoughts about Fedora 19 Xfce at work. While this isn't a typical topic for this "Open Source Software & Usability" blog, Linux aficionados may appreciate my views on using Fedora 19 Xfce as a day-to-day office desktop. I opted not to attempt a "dual boot" configuration on my work laptop. If this were my home machine, that might be a different story. But at work, I didn't want to mess with the standard desktop; as a CIO, I don't want to make things more difficult for our support staff. Fortunately, we had an unused external USB drive. It's a little old, but perfectly suitable to boot Linux. It was a fairly straightforward affair to connect this spare drive to a spare laptop to install Fedora 19 Xfce. 1. The install program has poor usability. Fedora used to have a very simple, easy-to-use installer. You answered a few simple questions using point-and-click or drop-down menus, then the installer did everything else for you. In the Fedora 19 installer, everything has changed. (Actually, I believe this changed in the Fedora 18 installer.) The installer now presents a warning label that the disk doesn't have enough room. When I clicked into the disk setup tool, I was given the option to "reclaim" space, but I really didn't understand what that meant. There was no button or other option to just "install," despite the fact that I planned to install only Linux on this drive. If I were a user with "typical" knowledge and "average" skill, I would likely be afraid to use this installer, lest it do the wrong thing. The installer's progress bar is equally confusing. Usually, when a program displays a progress bar and a message to indicate the percent complete (such as, "Installing … 50%") you might expect the progress bar to indicate the same "percent complete" as the text message. Not so during the Fedora 19 installation. The installer displayed a message that it was installing system software, and it was "50%" complete, yet the progress bar displayed something like two-thirds complete. I quickly decided not to trust the progress bar. And it's a bad sign when your users decide not to trust your software. The installer is a Fedora issue. My recommendation to the Fedora Project folks is to reconsider the new installer, and try to move back to a more streamlined installer that can be easily used by a user with "typical" knowledge and "average" skill. 2. Adding printers is confusing. After installing Fedora 19 Xfce on the external drive, I rebooted into the desktop. Things went very well until I tried to add a printer. The process was awkward, almost "klunky." You'd think adding a printer would be done under the "Printer" menu item. Not so; you must click the giant "+" icon. While I eventually figured it out, the action wasn't immediately obvious. Not a major obstacle, but menus would help. The user interface for adding printers needs some work. 3. The desktop works well. Overall, I am very satisfied with how Xfce performs as a modern desktop. A user with "typical" knowledge and "average" skill should be able to easily navigate the Xfce desktop. Unlike GNOME, programs in Xfce use menus. Everything worked pretty much the same, and menu items had obvious actions and responses. To be fair, I understand that GNOME does have a menu, located in the top bar next to the "Activities" menu. This isn't an obvious place for a menu, since it separates the menu with the program that uses it. That's an interesting UI decision for GNOME. I would argue GNOME fails the Obviousness criteria here, where Xfce succeeds. 4. Installing programs isn't obvious. Once I installed Fedora 19 Xfce, I realized not all my favorite programs were installed by default. For example, I chose to install Evince (a PDF file viewer), GIMP (a graphics program), Google Chrome (web browser), KeePassX (a password manager), and LibreOffice (an office program). I needed to download Google Chrome separately, and I knew that, but the others were optional packages in Fedora 19. There's no obvious menu item for "Add new programs" or "Install Fedora 19 packages" or something similar. Eventually, I tried the "Yum Extender" program, remembering that "yum" is a command-line package manager program that lets you install or remove packages. But "Yum Extender" doesn't accurately describe the action that it performs. Once I ran "Yum Extender," it was fairly easy to install the new packages I wanted. But I'll admit that I used "yum" on the command line to install the Google Chrome package; that was easier than figuring out how to install a local package from "Yum Extender." In a future post, I'll share some thoughts about the programs themselves. Fedora 19, codenamed "Schrödinger's Cat", was released on July 2, 2013. After about a week, I finally installed this on my laptop to explore the usability in Xfce. I've previously mentioned that Fedora has lost me. Before giving up entirely, I tried the alternate Fedora Xfce distribution, and found I liked it. It's no secret that I love the "Aura" desktop on Google's Chromebook / ChromeOS. The Aura desktop has a simplified look that is both easy for new users and flexible for power users. Aura provides very good usability: The desktop is familiar to both Windows users and Mac users, and the desktop functions more or less like the desktops on these other platforms. Since (almost) everything in the Chromebook runs inside the browser, programs share consistent behavior. Menus are not immediately visible, but are available. Actions provide obvious feedback. So while I like the usability in the Xfce desktop, I like the usability of Aura a lot more. But if you are technically capable, you can dramatically modify the appearance of Xfce to make it look and act like anything - like Aura. And I've modified my Xfce desktop to something similar to the Aura desktop. It works really well and I find it is even easier to use than the default Xfce desktop. I'm using a light grey theme instead of a dark grey theme. The other theme was great for a few days, but the darker colors made things more difficult to read. This light grey theme ("Adwaita") provides much better visibility. I've added a volume control ("Audio Mixer") next to the Notification Area. I modified the clock style so it also displays the date next to the time. I sometimes need to look up the date, and this saves me the step of having to hover my mouse over the clock to display today's date. I changed the Applications Menu icon to be a series of three lines, instead of the "3x3 grid." Icons are metaphors for things or actions, and the "3x3 grid" icon works well for the Aura desktop because Aura's Application Menu is presented as a grid of available applications. But Xfce's Application Menu is a hierarchical list, so the "3x3 grid" icon didn't accurately represent the action. In my mind, I didn't associate the "3x3 grid" icon with the Application Menu, even though I gave it that icon. But the series of three lines ("view-list-symbolic") provides a more accurate metaphor for the action it instantiates. Otherwise, I find the Xfce desktop to be very pleasant. While I haven't done a formal usability study of Xfce, my heuristic usability evaluation is that Xfce meets all four of the key themes for good usability: Familiarity, Consistency, Menus, and Obviousness. The menus are there, and everything is consistent. The default Xfce uses a theme that is familiar to most users, and actions are obvious. Sure, a few areas still need some polish (like the Applications menu, and some icons) but Xfce already seems pretty solid.